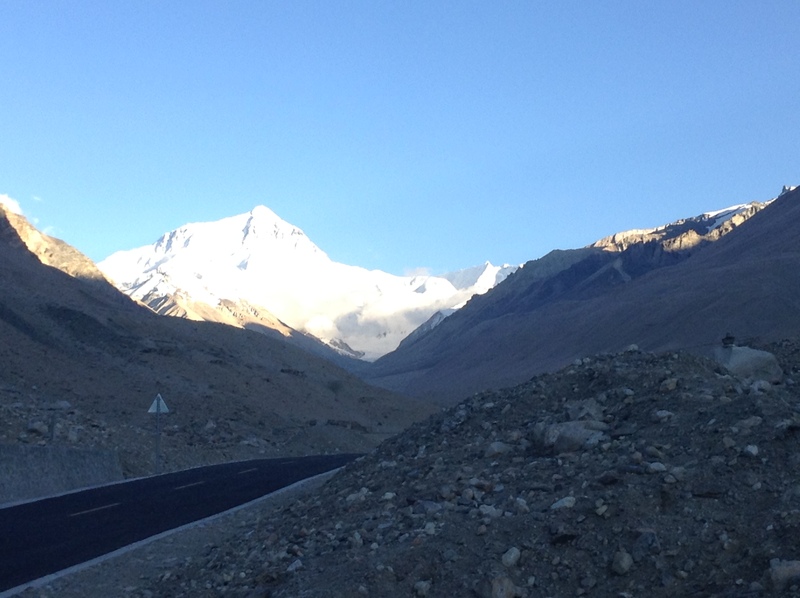 We’d arrived at Mount Everest National Park about four days into my trip and it was a beautiful, long drive. We were surrounded by mountains as far as the eye can see, some were covered in magnificent blankets of ice, others were brown and rugged peaks of dust that had a faraway simplistic beauty to them, which blended seamlessly into the landscape. After 5 hours on the road, we finally arrived at Mount Everest base camp and settled down into a tent which had a fire in the middle of it. That’s right – there was a fire inside the tent! And thank goodness – because for the hour or so that it was on, that fire provided us all with a welcome respite from the bitter winds of Everest. The tent was also a family home, where one of the guides lived with his wife and young baby. It wasn’t a traditional tent that you may be used to seeing. It was a fairly large tent, that had an area in the front where the guests stayed and the fire was lit, and another area at the back where the family stayed. Musty smelling blankets were stacked all around us, and the family in the tent brought us tea and noodles. We sat around the fire, talking, laughing and drinking yak butter tea. Yak butter tea is made from a special type of butter that comes from Tibet’s national animal – Yak, which is a type of bull. The yak butter tea smelled like a cross between strong mature cheddar cheese and fish. It tasted…worse. 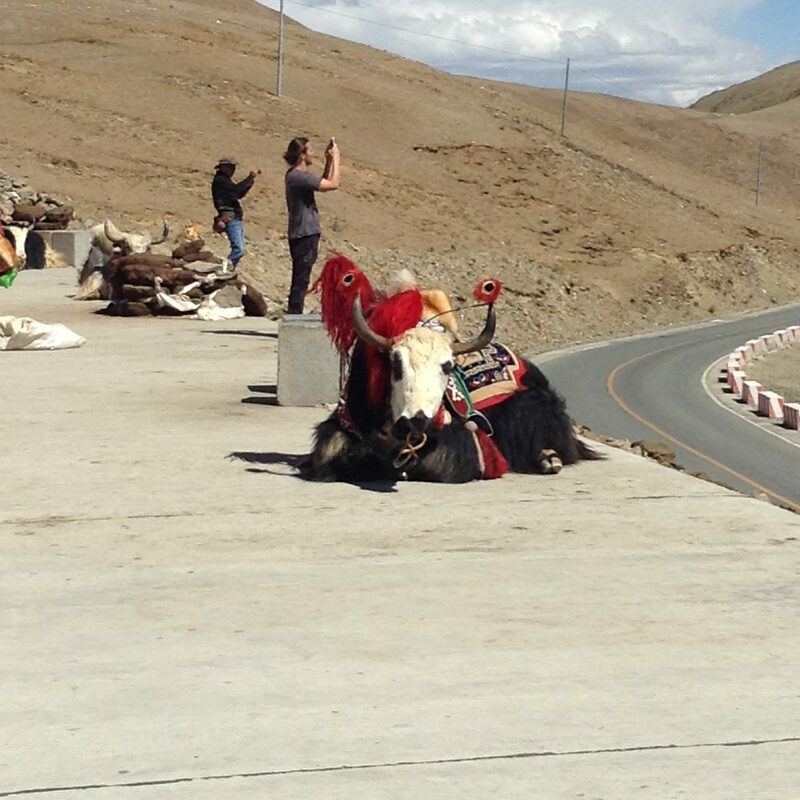 It is said to be very beneficial for altitude sickness, which a lot of foreigners like me suffered from. My difficulty in breathing was due to the fact that we were more than 5,000 metres above sea level and the air was getting thin. Altitude sickness is also called mountain sickness and is brought on by climbing to higher altitudes, where oxygen levels are significantly reduced. The symptoms range from a mild headache and loss of breath to dizziness, tiredness and severe vomiting. If left untreated, it can be fatal. For me, it felt like I had a really bad flu and that I had a boulder sitting on my chest. I had a slightly milder form of altitude sickness when I first arrived in Tibet because it was more than 3,000 metres in the air. However, after a few days, I began to acclimatize. However, when I arrived on Mount Everest, which was 2,000 metres higher, those symptoms came back with a vengeance. Luckily, the tour guide had an oxygen mask available. It was a precarious situation because if I’d gone downhill so to speak, the entire mission would have been aborted and it would have forced the entire tour group to make their way back down the mountain. And I would have felt awful. Thankfully, that was not what happened. 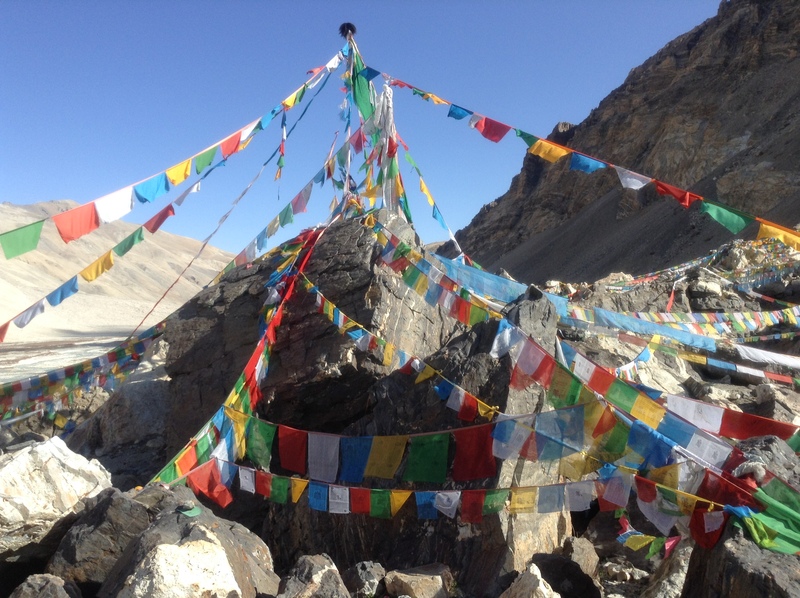 So the guides covered me in heavy blankets, offered me plenty of yak butter tea and tried to comfort me. 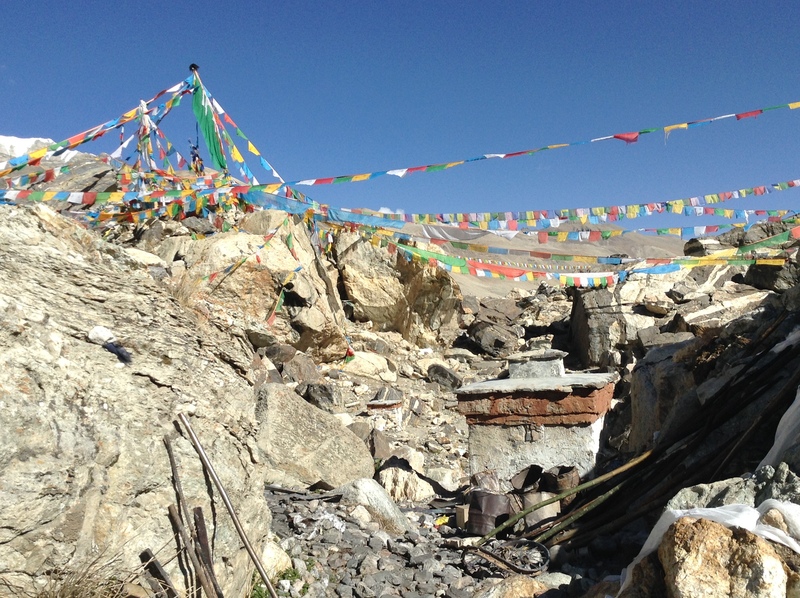 It was Tibetan hospitality – Everest style. Forcing myself to drink yak butter tea was no fun, but if you pretended you were drinking soup, the taste made more sense. Then the fire went out in the tent, and the bitter cold crept back in again and the 7 heavy blankets and 3 warm sweaters I was wearing did little to abate it. It was the kind of chill that sunk deep into your bones and turned your blood into rivers of ice. I’ve never experienced anything like it. 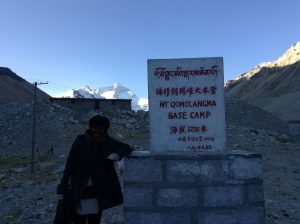 Somehow I fell asleep on a large shared sofa in the tent and was woken up bright and early at 4 in the morning and invited to go for a starlit walk towards Mount Everest. I promptly declined and went straight back to sleep! The next morning, a few of us went to a nearby toilet hut to get changed. It was the stuff of nightmares. I’m not sure what I expected, but here’s what I didn’t expect: a concrete hut which was pitch black on the inside despite the large windows…which were directly in front of the cubicle. The inside of the toilet hut smelled like the strongest sewage I’ve ever smelled. I also had to be careful not to fall down one of the big, round holes that I spotted with my torch. There was excrement everywhere and what looked like a dead animal inside one of them. If it hadn’t been so cold outside, I would have opted to get changed behind a bush. To make matters worse, I also had to pay to use the toilet. After that ordeal, I tried to put those awful toilet blues to the back of my mind and joined the others for some yak butter tea and pancakes. We then went for a hike towards Everest, also known as Mount Qomolangma. I felt lucky, because it was a clear and beautiful day and once we made the short hike to Mount Everest base camp, we had clear views of the landscape below. 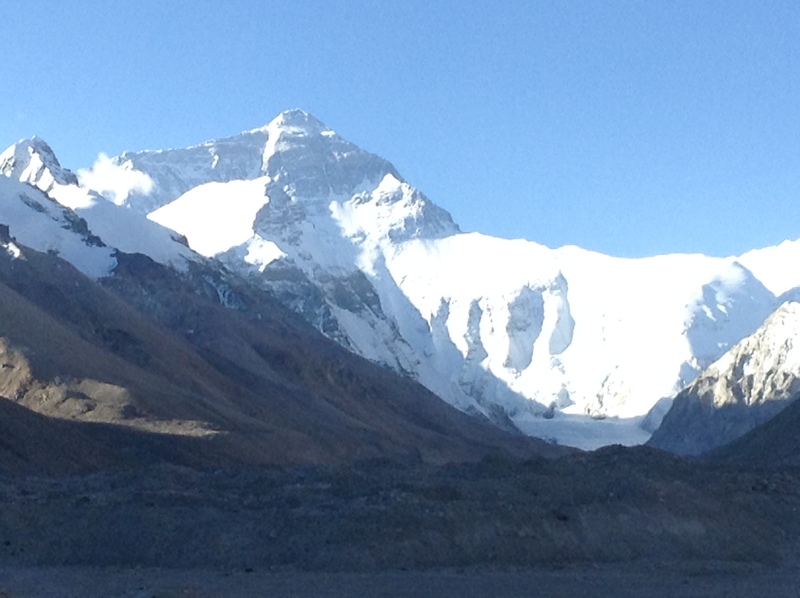 Mount Everest base camp is a little bit of a misleading name, however. Because while you do get a sense of how powerful and majestic the mountain is, you are not actually on the mountain. Just near it. To climb Everest itself, you would need about £70,000 and a team of Sherpas and guides to assist you. This seemed a little excessive to me but this breathtaking mountain has claimed the lives of so many explorers and nowadays you need to pay for a strong team of explorers to boost your chances of making it back alive. Before heading back, I went with a fellow traveller to visit the Rongbuk Monastery which was a 20-minute walk from the camp. 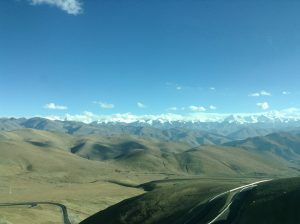 The monastery was said to be one of the first places Guru Rinpoche came to meditate when he brought Buddhism to Tibet. It was a small, simple monastery based on top of a mound of rocks in the area. We spent a short while being led around the monastery by one of the monks, and shown some of the historical spots in the temple. The temple resembled a cave more than an actual monastery and it was dark and small inside. I steadied my hand against the stone walls and lowered my head in order to make my way around. But what it lacked in size, it made up for in symbolism. It was a small, stark reminder of the way in which the peaceful and meditative nature of Buddhism weaves its way into every aspect of Tibetan life. Outside the cave were many brightly coloured flags tied to various wires and polls where you could make a wish. I made one sincere wish to return once again to this beautiful spot one day. 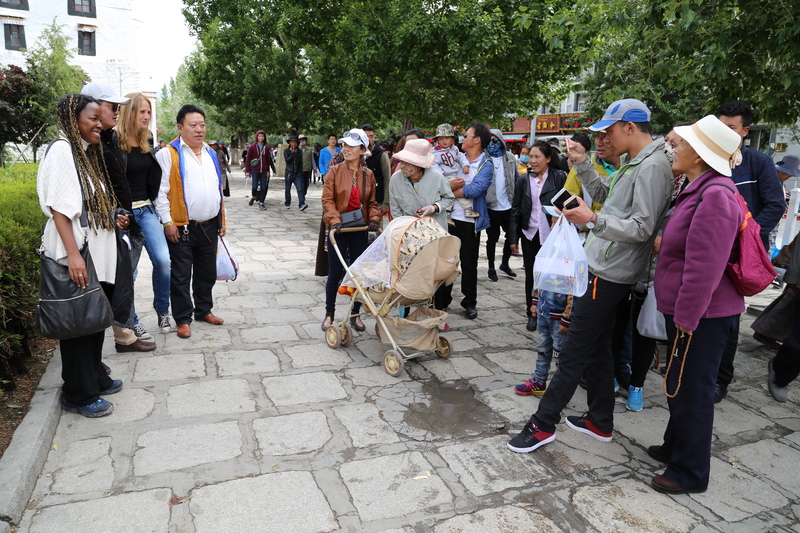 After spending the morning with Everest, it was time to gather our things and make our way out of Everest National Park and head to a Tibetan town called Shigatse, where we went to visit some temples and eat at some local delicacies. 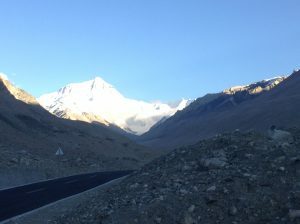 Despite the cold, and the altitude, I couldn’t help but feel a sense of sadness as we drove away from Everest, which in the short space of 24 hours, had given me so many enriched memories and experiences.